Russian physician and missionary to the Jews; born in a small town in the government of Kiev, Russia, in 1839. He spent several years in Rumania, and was baptized in Berlin in 1863. Benzion studied medicine and was graduated by the University of Würzburg in 1867. He went to England, and having entered the service of the British Society for the Conversion of the Jews, was sent out to Rumania in 1874 as a medical missionary to the Jews. Transferred to Odessa, Russia, in 1876, he remained there for ten years, acquiring a considerable reputation as a medical practitioner and as a missionary. He left Odessa for Constantinople in 1886, but was not known as a missionary after 1888. He now lives in the United States. 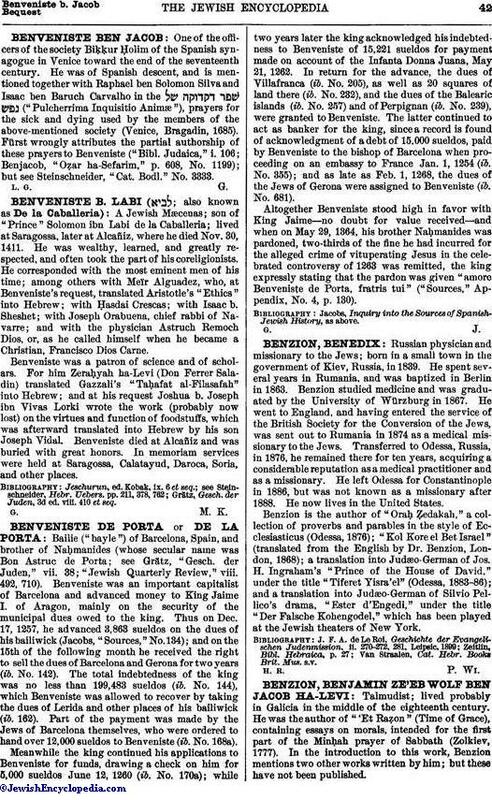 Benzion is the author of "Oraḥ ẓedakah," a collection of proverbs and parables in the style of Ecclesiasticus (Odessa, 1876); "Kol Kore el Bet Israel" (translated from the English by Dr. Benzion, London, 1868); a translation into Judæo-German of Jos. H. Ingraham's "Prince of the House of David," under the title "Tiferet Yisra'el" (Odessa, 1883-86); and a translation into Judæo-German of Silvio Pellico's drama, "Ester d'Engedi," under the title "Der Falsche Kohengodel," which has been played at the Jewish theaters of New York. Van Straalen, Cat. Hebr. Books Brit. Mus. s.v.